Time reveals all. Years ago, when Prince Harry was a teenager, rumors circulated that his REAL father was Princess Diana’s onetime beau James Hewitt. 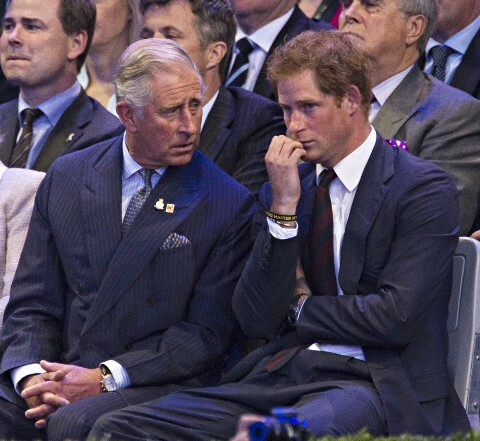 A resemblance between Harry and Hewitt was noted, but the rumor was not true and hurt Harry’s feelings at the time – not to mention the feelings of his father Charles. Prince Charles and Harry were photographed together at a London event this week and anybody who says they don’t look alike must have defective vision. Time DOES reveal the truth. Just like in the case of Michael Jackson’s son Prince, who grew up to look just like his biological father Dr Arnold Klein. BELINDA CARLYLE’S HIPS ARE SEALED!